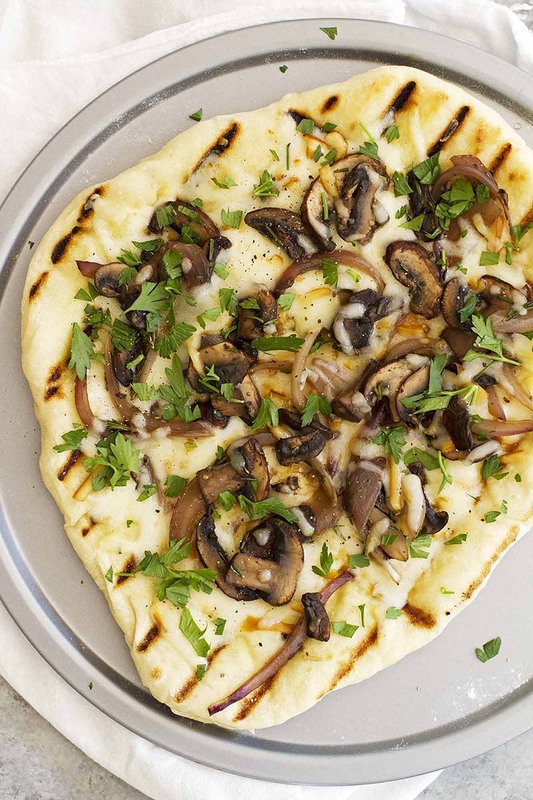 Fresh and flavorful with a soft and chewy homemade crust, this grilled pizza is the perfect recipe for summer. In large bowl or bowl of stand mixer, stir yeast into warm water to dissolve. Use wooden spoon or dough hook attachment to stir in 2 cups flour, salt and olive oil until dough forms. On lightly floured surface, knead dough by hand 10 minutes, adding just enough remaining flour until dough is smooth, soft, elastic and only slightly sticky; OR, knead in stand mixer with dough hook on medium speed 5 to 7 minutes, adding just enough remaining flour until dough is smooth, soft, elastic and only slightly sticky. Shape dough into ball. Transfer to lightly oiled bowl; turn once to coat. Cover with plastic wrap and let rise 1 to 1½ hours until doubled. Meanwhile, prepare the toppings: Heat truffle oil in large nonstick skillet over medium-high heat. Add mushrooms, onion, rosemary and salt and pepper to taste. Sauté 5 to 6 minutes just until mushrooms are softened. Remove from heat. When dough is nearly risen, heat both sides of gas grill on high (500 to 600°F). After 10 minutes, turn off one burner. Punch down dough and divide in half. On lightly floured pizza stone, stretch and roll one piece of dough to 9-inch circle (no worries if it's not a perfect circle). Brush top of dough lightly with olive oil. Transfer to grill over direct heat, oiled side down. Cover and grill 1 to 3 minutes until bottom of crust is just set and char marks appear. Brush top of dough with more olive oil, then use tongs to flip crust over and transfer to indirect heat. Top crust with half of mushroom mixture and half of shredded cheese. Cover and grill 2 to 3 minutes until crust is cooked through and cheese is melted. Remove pizza from grill. Sprinkle with 1 tablespoon parsley and more pepper. Repeat with second pizza dough. Serve immediately.